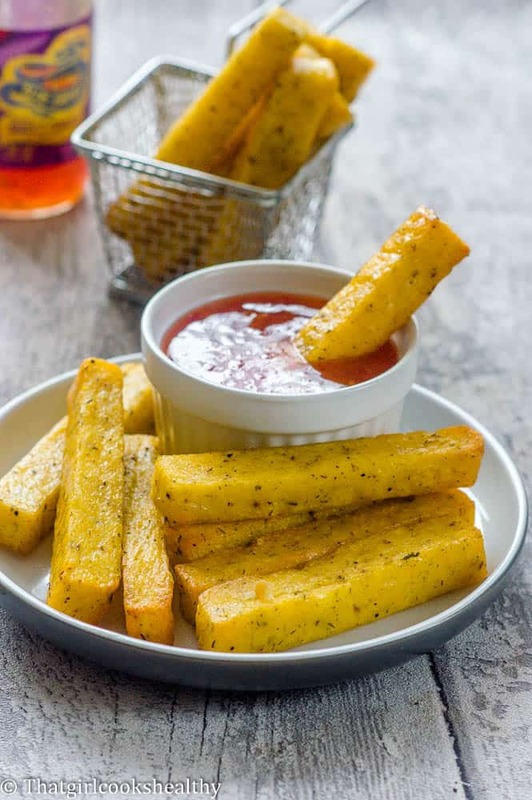 Funchi fries – delicious fries made from seasoned cornmeal/polenta with a crispy golden outside with a gooey creamy interior perfect for some dipping sauce. I’m pleased to share a recipe that is from the Dutch Caribbean, a part of the Caribbean that I feel is over looked. If you’re looking for a side or appetiser with a difference when this recipe is you. It’s cheap and cheerful and inspired by the tiny ABC islands (Aruba, Bonaire and Curacao). If you’re from the Caribbean then you will probably already know what funchi but know it as a different name. Funchi is a dense mush made from cornmeal (polenta) water and butter. The water is boiled while the cornmeal is vigorously stirred in until it thickened and looks almost like a pudding consistency. The funchi is moulded to shape and because it is bland, forms part of a side serving to accompany a main meal. 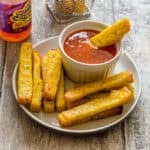 Funchi fries aka funchi hasa more commonly known as polenta fries in Europe are a great concept of turning this cornmeal mush into fries, it sounds weird but totally works. I was first inspired by this recipe from Caribbean spice girl. I was initially skeptical about this recipe because I couldn’t fathom the idea of making cornmeal/polenta into fries. 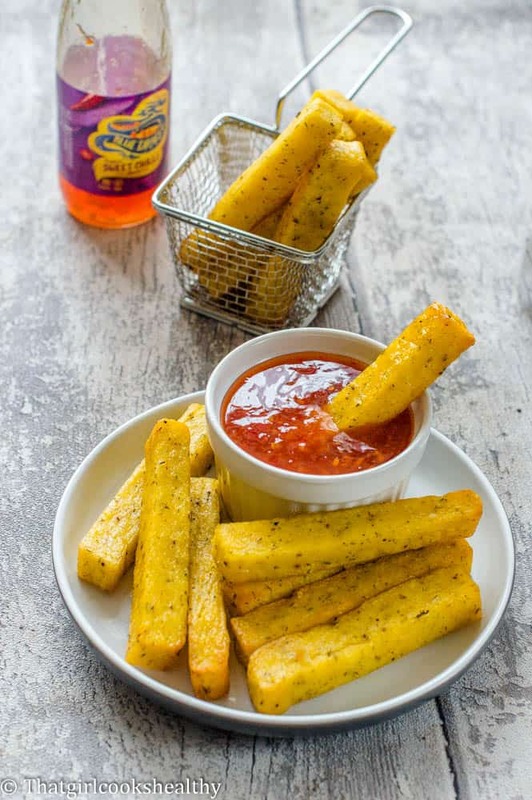 I gotta tell ya these polenta fries baked in the oven are the real deal. 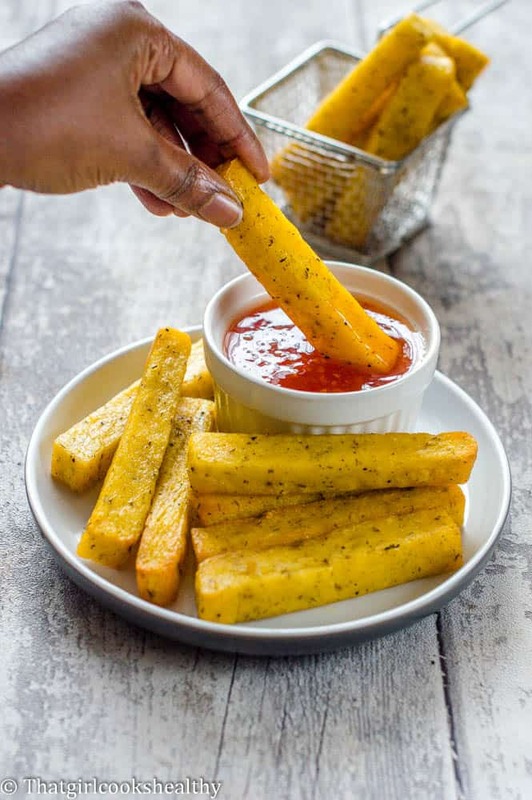 I know the Italians adore their vegan polenta fries but in the Caribbean, cornmeal/polenta serves another purpose. This is a revolutionary method of preparing fries the island way. 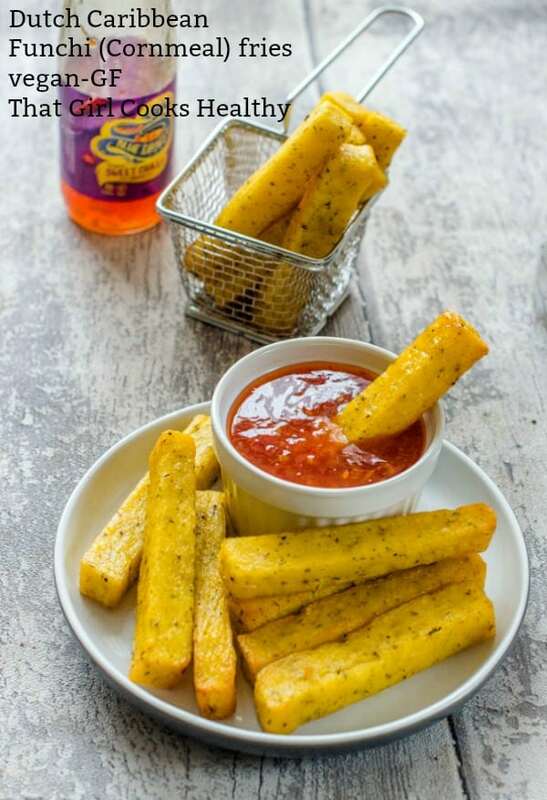 Funchi fries are very easy to make with only a small handful of ingredients. As you can see from the ingredients list, the funchi fries will be generously seasoned and not bland. In order to make the funchi into fries, we need to prepare the cornmeal mush. The best way to cook polenta (cornmeal) is to first of all boil the water alone and add the cornmeal in intervals while vigorously stirring. Alternatively, you can add both the water and cornmeal to a saucepan and turn on medium until to thickens. The key to avoiding lumps is to stir, stir and stir some more until the cornmeal actually dissolves and thickens. If you aren’t capable of mixing while slowly (very important) stirring in the cornmeal first, then adding everything to the pan will probably work in your favour. Seasoning – my choice of seasoning is garlic, thyme, pink salt and parsley. I find these ingredients work quite well together. Forming the fries – You will need a long tray like a swiss roll tray to pour the funchi into. Setting – The fries will set as it moulds and cools in the tray which takes roughly an hour. Then cut horizontal line and then cut into fries. The size is dependant on whether you want thin fries or more chunky chips. Baking the funchi – Once the funchi fries are cut into the desired shape then coat them with oil, ready to bake in the oven. Make sure to turn them half way so they crisp evenly. 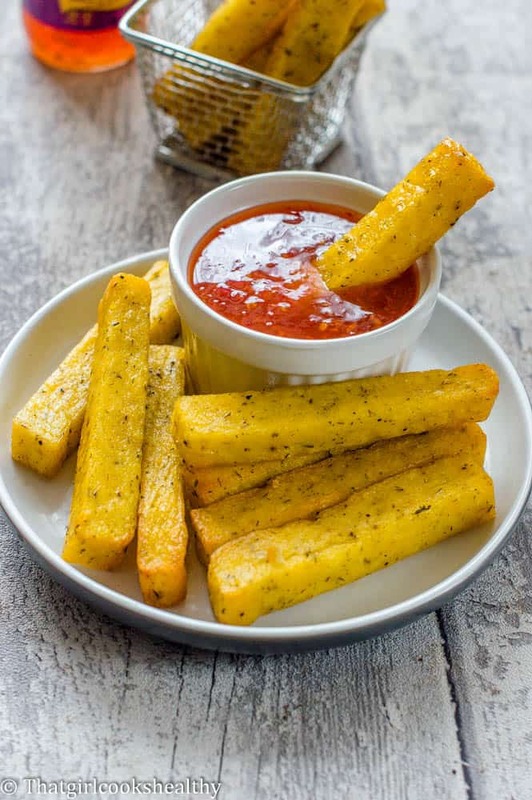 Dipping sauce – hot sauce or sweet chilli works really well with the fries. You gotta have a dip! Funchi fries – The video!! Boil the water then proceed to slowly stir in the cornmeal then add the vegan cheese. Add your condiments to the mix once the funchi is ready pour onto deep baking pan/swiss roll tin. Refrigerate for an hour and place the tin facing downwards on some parchment and release the funchi onto the paper. Then cut in half lengthways. Cut into chunky or thin strips (your choice in size) then coat the fries with olive oil and place on a baking tray lined with parchment paper. Bring the water to the boil in a saucepan. Slowly add the cornmeal to the boiling water while turning vigorously at the same time so lumps aren’t formed. Lower the heat to medium and stir in the cheese, butter and seasoning. Continue to stir the cornmeal for 15 minutes during this time it will thicken to the point where it will pull away from the side of the saucepan into a ball, that’s when it’s ready. Quickly transfer the funchi into a non stick baking tray (1inch deep) or swiss roll tin. Spread/evenly distribute the funchi mixture. Don’t worry if it’s not smooth from spreading. Allow to cool completely before refrigerating for 1 hour. As the funchi is left to chill, preheat the oven to 200c approximately 10-15 minutes before it’s taken from the refrigerator. Remove from the refrigerator, lay out some parchment paper and tip the tray facing downwards so it releases from the tin. Place the funchi fries on the baking tray and then coat them each evenly with olive oil. Bake until the exterior is golden and crispy for 30-40 minutes turning the fries half way through cooking . Serve with dipping hot sauce. Thank you, Charla, these sound delicious! I can’t wait to try the recipe and will be sure to seek funchi out next time I’m in the ABC’s! Hi Aimee. Thank you! I hope you enjoy it as much as we do. These look wonderful–What a delicious change from regular fries! Thank you! Definitely a great alternative to regular fries. So glad you joined our party!! These fries are amazing – hope to see you next week too! I appreciate your great recipes! I know you work very hard to explain everything in detail. Your website rocks! Aww thank you for the love Diane. I do try! !